Last month we learned that the Green Hive, a non-profit supporting green building and eco-friendly ideas, was kicked out of its future home in Downtown LA by the LA Community College District. So we were wondering: What are they doing now? First the backstory: A top building official with the LACCD last year signed a $190,000 contract “on behalf of” the district’s executive director of facilities planning and development, Larry Eisenberg. Eisenburg worked with The Green Hive’s two business partners, Kris Kimble and Kim Robinson, and LACCD spent over $1 million in district money to help The Green Hive design its 6,000-square-feet office space at 811 Wilshire Boulevard. But this April, the president of LACCD’s board of trustees informed Kimble and Robinson that the project was never approved. This notice came as a surprise since The Green Hive has “five binders of correspondence between it and district officials,” reported the Daily Breeze. Without the 811 Wilshire location, The Green Hive lost its business model and its corporate sponsors cannot be utilized, Kimble told The Architect’s Newspaper. And here’s what’s happening now: Kimble has been able to connect with organizations in Orange County, Sacramento and San Diego. They are interested in either hiring The Green Hive as consultants or uniting forces. The Frontier Project, a nonprofit seeking green alternatives, is interested in co-branding with the group. Kimble said The Green Hive will help them build their resources in their facility, but this potential brand partnership will not dissipate The Green Hive’s original business model, which--at the moment--has been put on hold indefinitely. “We’re just trying to stay alive,” Kimble said. Without office space, this green idea will rot even though it has over a dozen corporate sponsors and funding for eight internships. Even though the complete come-see-and-touch business model has been put on hold, Kimble said he still champions the green movement and urges those in the corporate and private sector to donate to The Green Hive Foundation so that The Green Hive could continue providing online resources. Broad Museum Leak Number 100: Diller Scofidio + Renfro? In a selection process with more leaks than the Titanic (or, ahem, the Gulf of Mexico) the LA Times reports (thanks to a number of anonymous sources) that Eli Broad is favoring Diller Scofidio + Renfro for his new contemporary art museum. 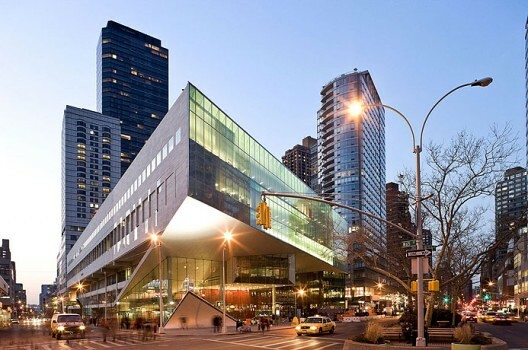 In a previous leak the Times reported the narrowing of firms to Diller Scofidio and Rem Koolhaas's OMA. This of course follows the leak that we first reported in March: that Broad was favoring downtown for the museum instead of Santa Monica. Of course none of this is official. In fact Broad hasn't even formally announced a shortlist or a location. And he's still waiting for city approval to lease the Bunker Hill site for $1 per year for 99 years (the LA CRA now owns the site, just next to the Walt Disney Concert Hall). But all this insider information is giving Washington politics and Wall Street banking a run for its money. Man, this Broad guy really knows how to play cities, and the media, doesn't he? He should become a businessman or something. Meanwhile, is any firm hotter than Diller Scofidio + Renfro? 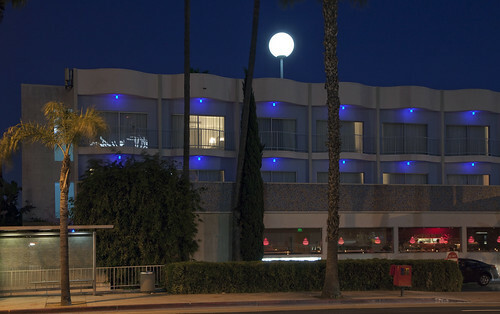 What's that on the roof of Hollywood's Standard Hotel? Is it a....giant light bulb? Well, yes. Artist Piero Golia has installed a permanent, orb-shaped light (clad in acryclic, lit by eight fluorescent tubes, and sitting on a large steel spindle and crown) on the roof, called Luminous Sphere, that is quite visible from traffic below. It looks a little bit like a glowing golf ball on a steel tee. In a particularly quirky (and egotistical?) move, the light will go on when Golia is in town and off when he is out of town (it can be controlled via the internet). The project was organized by Culver City's LA><ART and executed by Zellnerplus architects, Buro Happold engineers, and Benchmark Scenery fabricators. LA><ART, which focuses on site-specific work while also maintaining its own gallery, is celebrating its fifth anniversary. Sphere launches its LA Public Domain (L.A.P.D, get it?) program (also sponsored by local group For Your Art) , promoting artistic interventions in experimental contexts. Now is that lightbulb a halogen? So the iconic HOLLYWOOD sign was nearly turned into the backyard for a bunch of mansions, but fortunately the recession intervened—one of a surprising number of upsides to the downside, it seems. But that doesn't mean those big white letters aren't seeming a little tired, and so a Dutch designer has come up with a rather clever new use that Curbed tipped us off to: turn the sign into a giant hotel. As Christian Bay-Jorgensen explained it to the Daily News, "The ultimate goal would be to preserve an internationally recognized landmark while helping the city generate badly needed funding." If that weren't bad enough, our pal Alissa Walker points us to Jeffrey Inaba's plan to uproot the individual letters, loaning them out to areas of town in need of cache. The design provocateur explains after the jump, plus images of both, uh, projects. Unplanned Surplus The Hollywood sign has exceeded its purpose. As a marketing tool for real estate development, it has generated value incommensurate with its own material worth. As a tourist destination, it is more popular than most buildings in LA. In lieu of a singular skyline, the sign is a default backdrop for televised New Year’s countdowns and late night comedy shows. The Hollywood sign has assumed an iconic role in the city far beyond its original ambition. Its value is an unplanned surplus. Think you've got a better idea? A couple of months ago we introduced you to the W Hotel in Hollywood, a collaboration of some of the leading design talent in LA. One of those firms, Sussman Prejza, just sent us a video that shows off their all-important fiery red and multi-colored "W" signs, seen throughout the building. In addition to the behemoth 35-foot-tall W on top of the hotel, the firm designed a slew of animated signs, which sparkle thanks to LED's, red and/or crystalline filters, and faceted, laser-cut acrylic surfaces. The signs vary from 2.5 to 5.5 feet tall and are programmed with their own dedicated control computer, 10 network switches, 61 power supplies and over 24,000 LEDs. And you thought all that Hollywood sparkle was simple, didn't you? Los Angeles' Permanent Supportive Housing program got a much-needed emergency shot of funds this week: a $5.2 million pledge from the Corporation for Supportive Housing (CSH) and Conrad N. Hilton Foundation. Though Los Angeles has more homeless people than any other city in the US, only in the last few years has it begun to catch up with other cities' level of services. 2005 saw a city-wide push to build supportive housing, a model borrowed from New York that combines affordable housing with services to help residents deal with mental illness, drug abuse, and disabilities. 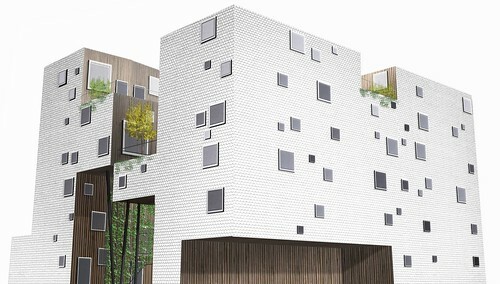 Top architecture firms helped fill out the new supportive housing landscape, with innovative projects such as Michael Maltzan's 95-unit, radially-arranged New Carver Apartments, Pugh + Scarpa's 46-unit Step Up on Fifth facility in Santa Monica, and Lorcan O’Herlihy Architects' 82-unit Skid Row Housing in downtown Los Angeles. But the economic downturn put a freeze on construction of new supportive housing and has forced program cuts, hiring freezes and layoffs. Out of the over 2,000 units under development since the program was launched five years ago, about 600 are shovel-ready but lack the financing to proceed, due to local government budget crises and frozen credit markets. The CSH and Hilton foundation's $5.2 million in grants and low-interest loans should get most of those projects going again. Since studies show that supportive housing actually saves the city money -- reducing costly time in jails and hospitals -- that may turn out to be not just a good deed, but a smart investment as well. Even though we already knew who had won ahead of time, we couldn't help getting excited about AIA/LA's ARCH IS__ awards, crowning "two exceptional young architects" at SCI-Arc on Monday night. 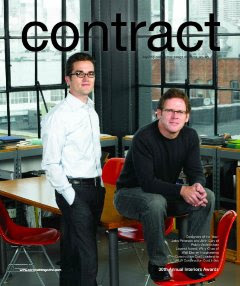 The winners: Oyler Wu Collaborative and Tom Wiscombe/ Emergent. Both are pushing the envelope in terms of design, materials, engineering, and program, and are even starting to (slowly) build things. Oyler Wu is known for its multi-functional, angular aluminum tube installations like Pendulum Plane at the LA Forum's new gallery space in Hollywood, and Density Fields at the M&A Gallery in Silver Lake. But with a new commission to build one of 100 new houses at the wacky but visionary Ordos development in Inner Mongolia, the firm is creating architecture. The size of their house (like all in the development) is ridiculous at around 10,000 square feet. But the design is quite innovative, featuring folded and faceted concrete geometries and interlocking u-shapes wrapped around a large internal void, lit internally by large light wells. Meanwhile Emergent is way ahead of its time in terms of fusing biology and architecture, with structural and mechanical systems that inter-weave and conduct heat, air, and water, just like natural organisms. 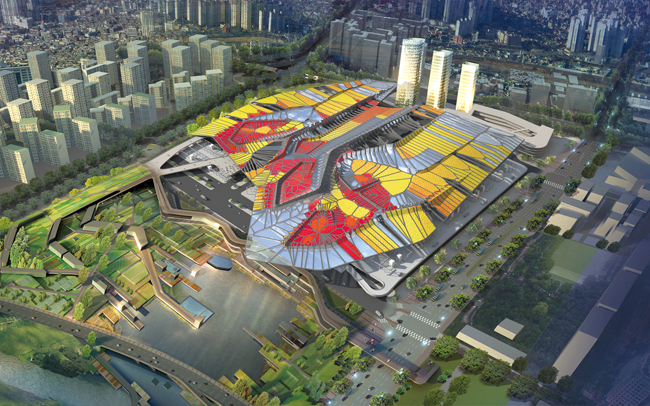 Its Garak Fish Market in Korea has a kaleidoscopic roof that features colorful gardens and double pleats which help form the structure and carve out niches for various pieces of program. To see more on these firms check out our next CA issue at the end of this month. Dear Angelenos: Would you like to save $10,000 this year? Move to a walkable neighborhood and leave your car at home. While this may be obvious—and unrealistic in many parts of our sprawling town—the Center for Transit Oriented Development (CTOD) is hoping to change the game with a new toolkit aimed at improving areas of Los Angeles in close proximity to transit stops. The CTOD, funded through a CalTrans grant and sponsored by Metro, has prepared evaluations of all 71 existing and proposed stations associated with heavy rail, light rail, and busways in the city. Utilizing the findings of those studies along with information gleaned from focus groups, the report offers strategies for expanding and creating new transit oriented districts around Los Angeles. "District" will replace "development" in the TOD nomenclature, at least that's the center is hoping as it strives for more organic strategies in the future, eschewing the top-down, Robert Moses-like approach of the past. While the biggest savings and benefits in the TOD system come through a reduced dependence on cars, some advocates believe adding additional parking at transit stations is the best way forward, at least in the short term. With Measure R raising $40 billion for transit-related projects over 30 years, and Metro’s Long Range Transportation Plan solidified, this new toolkit will hopefully influence positive growth around Los Angeles’ transit lines as they expand. Clearly, this fresh thinking is needed, as Christopher Hawthorne recently highlighted LA's lagging standards. 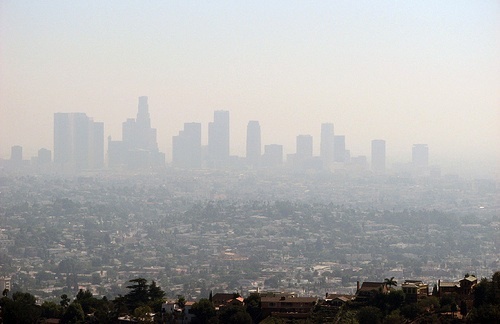 LA is rarely thought of as the country's greenest town, what with all the traffic and sprawl, but it's doing a lot better than you think, as the News informs us. For the second year in a row, Los Angeles has been ranked number one in terms of energy efficient buildings, according to the Environmental Protection Agency's Energy Star ratings. LA made it to the top of the list by having the most rated buildings—ones that use 35 percent less energy than the average—with 293. The top five include Washington, D.C. (204), San Francisco (173), Denver (136) and Chicago (134). This does not exactly mean it is the most efficient period, given that there are so many more buildings in LA—usual suspects like Seattle and Portland are missing from the top five, as is New York, which we'd like to think is missing because it's so dense, though probably the real issue is that it's so old an inefficient to begin with. Still, no matter how you look at it, this is a step in the right direction for all of us. UPDATE: A source close to the museum writes in with this: "Who knows what Deitch will do? It probably depends on what Eli Broad tells him to do." Which is pretty much what you might have guessed reading the (New York) Times' story on the whole affair on the Arts front today. Looking for hints in Tyler Green's first-out-the-gate interview with Deitch, we found none. Design was mentioned exactly once, in reference to a MOCA satellite at the Pacific Design Center. And yet Deitch's shows and showiness have a certain architectural scale about them. As always, anything goes and anything can happen. New York uber-collector and bombastic bon vivant Jefferey Deitch has been named director of LA's Museum of Contemporary Art. 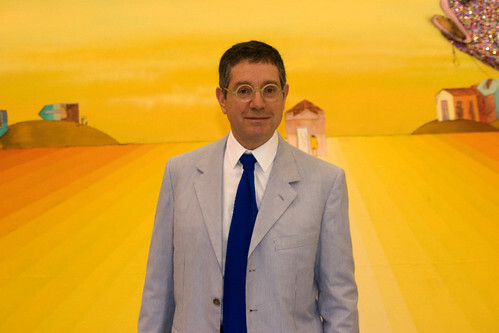 Deitch, a gallerist of late among many other things, has had a storied career, but he becomes about the only art dealer/gallery owner to assume leadership of a major U.S. museum. There has already been much talk about that sacred cow The Art World and What It All Means. But what most concerns us is that, while he is known for developing riské artists and outré installations—Swoon sailing the Hudson was a recent favorite—Deitch has little, or at least less, concern for design than some of his fellow gallerists. This may not bode well for the hope of re-establishing the museum's recently-gutted architecture department. (Brooke Hodge, curator of architecture was removed last May, and the museum cancelled its blockbuster Morphosis show as well). Granted if Deitch is anything he is unconventional and unexpected, so who knows what could happen. Which is why LA's gain is New York's loss, as with the deal comes the closure of one of the most exciting galleries in the country.